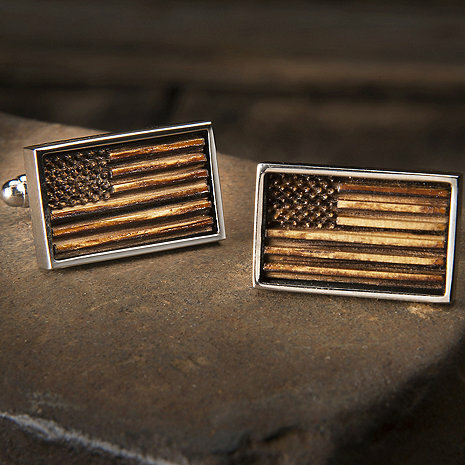 The ultimate accessory for any gentlemanly occasion, these unique American Flag cufflinks are made with reclaimed whiskey barrel wood provided by the Jack Daniel's Distillery. Each pair of cufflinks will arrive handsomely gift-boxed with a designer signed letter of authenticity. 10% of proceeds generate from each sale with be donated to benefit "Operation Ride Home". ORH is a Jack Daniel's Distillery supported program assisting select active military members with travel from their respective bases to their home during the holiday season. I ordered these as a gift for my husband! They are just gorgeous and he really loved them. Arrived quick as well. Love the look of the wood flag, very unique in appearance. Really a great gift item for any guy!